In the early period of colonization, most Scottish settlers were introduced to Canada through the fur trade. In the 1720s, the Hudson's Bay Company began recruiting employees from the Orkney Islands, the last port of call for Company ships heading across the Atlantic. Reputed for their thrift and endurance, an average of seventy young Orcadian men went into the Company's service each year until 1800. The British government was eager to attract young, hardy settlers to exploit the riches of its newly-acquired colonies. An editorial from a 1760 issue of the Glasgow Journal trumpeted the limitless opportunities overseas: "The expense of this Conquest is the most thrifty disbursement ever made - an exclusive fishery! boundless territory! the fur trade engrossed! innumerable tribes of savages contributing to the consumption of our staple! There are sources of exhaustless wealth! Ignorant and designing men have called this a quarrel for a few dirty acres of snow, but the public will soon have feeling proofs that Britain must sink or swim with her colonies." In 1765, the Philadelphia Company of Pennsylvania, a group of fourteen British Protestants living in the colonies, bought two hundred thousand acres of land in Pictou, Nova Scotia from the British Government in hopes of creating an influential maritime settlement. After the Hector delivered one hundred seventy Highlanders to the new settlement in 1773, a steady influx of families began streaming into Nova Scotia and Cape Breton. The Hector was old and in poor condition when she left Lochbroom in July 1773; the arduous voyage took eleven weeks. 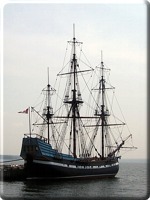 Delayed two weeks by a gale off the coast of Newfoundland, the Hector did not arrive in Pictou Harbour until 15 September. Its passengers, twenty-three families and twenty-five single men, Gaelic-speaking crofters and artisans from Lochbroom, Ross-shire (save ten men from Greenock) had been recruited with the promise of free passage, one year's worth of free provisions, and a farm. 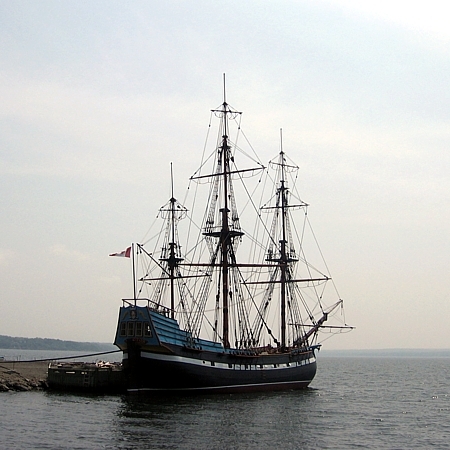 By 1776, Pictou, known as "the birthplace of New Scotland," had become the premier maritime destination for Scottish immigrants. During the early eighteenth century, the British government introduced large numbers of Highlanders to Canada through the military. The government prized its Highland soldiers as among the finest in the world, renowned for their bravery, endurance, and loyalty. Highland regiments played an important role during the Seven Years' War, earning the fear of French forces in Canada. When William Davidson of Caithness resettled in Fort Frederick, Nova Scotia (now New Brunswick), after a Highland Regiment garrisoned it near the end of the war, a large number of Scottish traders followed him. When the war ended in 1763, a number of the soldiers and traders stayed in the region. Indeed, many officers and foot soldiers in the Highland regiments were impressed by the land in which they fought, much more lush and fertile than what they knew back home. The government awarded many of its soldiers with generous freehold land grants in the conquered region of Quebec. These individuals quickly dominated the fur trade, in the process dominating the whole of Canadian commerce as well, and created networks that would endure for many years. The first major exodus of Scots to North America began in 1770 as the Highland Clearance began taking full force. However, when the American Revolution broke out in 1776, thousands of Scots fled north where they would take up the Royal Standard and fight for the British Crown. Many of these people retained old communal attachments and migrated in groups. At the end of the war in 1783, the government resettled approximately ten thousand such servicemen and their families in the conquered region of Quebec at public expense. Another thirty thousand Scots living in America decided to remain British subjects following American Independence. Fourteen thousand of these refugee United Empire Loyalists arrived at the St. John River at the war's end, seeking asylum in Nova Scotia. The following year, 1784, Nova Scotia was partitioned, and the colony of New Brunswick created; Cape Breton would soon become another hugely popular destination for Scottish immigrants. Once the Loyalists had gotten established in the new country, their thoughts turned toward the future. They would need mills, they would need teachers and doctors and clergymen. The Scots who had gone to Quebec were dissatisfied with the French institutions they found there, and wanted to return to British forms. In 1791, a border was drawn between the French and Loyalist settlements, officially dividing the colony into Upper and Lower Canada. 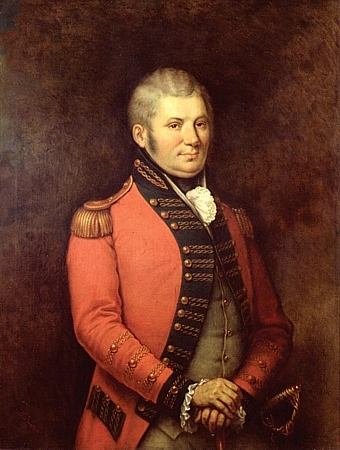 John Graves Simcoe, the first Lieutenant-Governor of Upper Canada, divided the new province into nineteen counties, the easternmost of which was named Glengarry, in honour of its Roman Catholic, Gaelic-speaking Highlander population. The kin and clansmen of these Inverness-shire natives were, at the same time, suffering the full effects of the Highland Clearances at home; and as they received favourable news from abroad, the residents of Glengarry, Inverness-shire, left in droves for the New World. By 1806, over ten thousand Scots had left their native Glengarry for the new community of the same name in Upper Canada - and Gaelic was the third most commonly spoken European language in Canada, after English and French. Also intrigued by the potential of the new world, and equally distressed by the plight of the dispossessed Highland crofters, Thomas Douglas, 5th Earl of Selkirk, developed a scheme that would serve both a humanitarian and a patriotic cause. Believing that emigration was the solution to the problem of over-crowding and the key to strengthening Britain's hold in North America, he brought eight hundred colonists to Prince Edward Island in 1803. 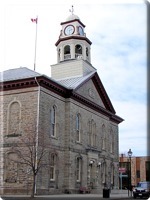 Inspired by the success of the colony, Selkirk founded a small community in south-western Ontario the following year. 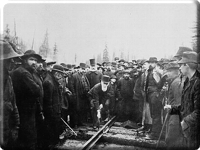 Although the Baldoon enterprise failed, Selkirk established another successful community in Red River, Manitoba, in 1813. There were difficulties, to be sure. The heavily-timbered, isolated wilderness provided the first settlers with enough obstacles to surmount before their homes and crops could sustain them through several Canadian winters. But by and large, the new settlers found the kind of prosperity that had simply been impossible to achieve in Scotland: land was readily available, military service was not required of the colonial population, taxes were low, Roman Catholics were free to worship as they pleased, and immigrants were allowed to participate in politics and public affairs. Driven and determined, these early Scots, most of whom spent several years saving the money to emigrate, built the very foundations of their new country while retaining the traditions of their homeland. However, the British government was at first careful to limit the number of colonial settlers. Until the 1810s, Britain had operated on the theory that a nation's wealth could be measured by its population. But as the prominent economist Thomas Robert Malthus drew attention to the potential dystopian disaster of a population that had outstripped its resources, attitudes toward emigration began to change. The American invasion of 1812 had furthermore made the government aware of the immediate necessity for a more secure colonial border, which could only be accomplished through settlement. So in the nineteenth century, the Colonial Office sought to relieve Britain of its poverty-stricken, surplus population while strengthening the overseas empire by offering programs of assisted emigration. The government offered incentives such as free passage, free farm land, discounted provisions, etc., to families willing to become colonial pioneers in British North America. In 1815, Lord Bathurst, Secretary of State for the Colonies, sought to replicate the success of the Glengarry Scots. 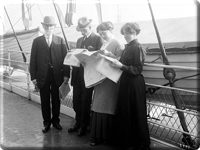 The government advertised for its assisted emigration scheme in newspapers all across Scotland. In exchange for a refundable sixteen pound deposit, the government offered families free transportation, 100 acres of land in Upper Canada, food rations and farming implements. Four ships filled with seven hundred farmers and labourers, half from Perthshire and Inverness-shire and half from Lanarkshire and Ayrshire, set sail from Greenock for the Rideau Valley. The settlers cut trails through thick forests to get to their land, situated west of Glengarry County. This settlement was to provide a second line of defense between the St. Lawrence and the Ottawa rivers, one of a series of new settlements the government planned to build along the border, in addition to an internal waterway linking Kingston with Ottawa. Filled with demobilized soldiers and civilians, these new settlements would provide resistance to future invasion. As early as 1817, the government was satisfied with the shape that the Rideau Valley settlements were taking; Perth, the military base at the centre of the settlement, had already drawn a population close to two thousand. Accurate statistics for immigration to British North America for the period between 1815 and 1870 are unavailable; annual totals are only rough calculations, and sophisticated breakdowns of the figures by place of origin or destination do not exist. However, it was during the nineteenth century that the Scots established themselves as one of the major ethnic components of the Canadian population. According to statistics kept by the British government, 14% of the 1.3 million British subjects that sailed to British North America during this time were born in Scotland. And whereas up to half of the first Scottish immigrants had settled mostly in the Maritimes, 95% of them were coming to the united province of Canada by the 1850s. According to the first Canadian census of 1871, 157 out of every 1,000 Canadians were of Scottish origins, a figure quite similar to todays. The Scottish distribution ranged from a low of just four percent in Quebec to twenty percent in Ontario and to a high of forty-five percent in Prince Edward Island. Unlike the earlier immigration patterns, which were composed almost exclusively of semi-pastoral Highlanders, nineteenth century immigration brought a fairly representative cross-section of virtually the entire Scottish population. People set out from both the Highlands and Lowlands in considerable numbers, and in the Lowlands they left both the agricultural districts and the industrialized urban centres. Many immigrants from this period were brought to the colony through government-sponsored resettlement schemes or through private charitable organizations. Even landlords, desperate to unload their surplus population, sponsored the emigration of their tenants. "I was never so happy in my life, we have no desire to return to Glasgow to stop there, for we would have to pay a heavy rent and here we have none: in Glasgow I had to labour sixteen to eighteen house a day and could only earn about six or seven shillings a week - here, I can, by labouring about half that time, earn more than I need. There I was confined to a damn shop - but here I enjoy fresh air." Speculative companies emerged, buying land from the colony at low prices, bringing out settlers to clear and cultivate the land, and then profiting on the resale. The Canada Company, incorporated by an act of British Parliament in 1825, assisted emigrants by providing them with low fare across the ocean, inexpensive land, and discounted provisions. Scottish novelist John Galt, the company's first superintendent, purchased ten thousand square kilometers east of Lake Huron from the government of Upper Canada in 1826. On St. George's Day the following year (23 April 1827), Galt and his employees celebrated the foundation of Guelph with the ceremonial felling of a large maple tree. The Canada Company built roads, mills, and schools for the town, its design based on a series of streets radiating from a focal point at the Speed River to resemble a lady's fan. 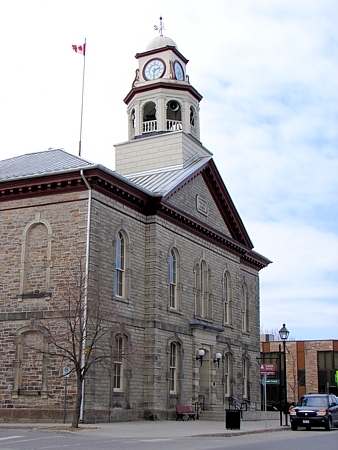 Galt named the town for the dynasty from which the British royal family was descended, and within ten years Guelph's population had reached two thousand. 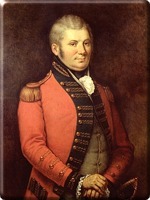 William Dickson, a native of Dumfries, Scotland, bought land from the Six Nation Indians surrounding the Great River in Upper Canada in the early 1800s. He recruited potential settlers for Dumfries township from Selkirk, Roxburgh, and Dumfries counties in 1809, and treated them paternally. Dickson became known for advancing large sums of money to settlers in need and for his leniency with down payments. Bearing the expense of their travels, Dickson also provided his settlers with livestock, tools, and provisions, for their first year. By the 1840s, over six thousand people had settled in the area, and land that Dickson had purchased for a dollar per acre was selling for five times that amount. While most nineteenth century immigrants hailed from the working classes, a considerable number of well-to-do business and professional figures came to British North America in the nineteenth century as well. Most prominent among the middle-class immigrants were teachers and religious leaders, followed by men with medical and legal training. Highlanders generally continued to cluster in the same areas their ancestors had before the Napoleonic Wars - Nova Scotia and Cape Breton, Prince Edward Island, and the eastern districts of present-day Ontario. Lowland farmers settled in the broad, arable fields of western Ontario while urban artisans and middle-class people gravitated towards cities like Montreal and Kingston. But whether Highlander or Lowlander, the Scots shared two common tendencies: to settle among their fellow countrymen and to foster Scottish institutions within their new communities. Public life centered on the Kirk or church - the major vehicle through which emigrants retained their cultural identity - and various fraternal organizations, such as St. Andrew's Societies, Burns Clubs, and Masonic lodges. The Scots were also quick to build local schools for their children; those who went on to university often found schools built on Scottish models, with courses dominated by Scottish professors. The Scots, too, were quick to inundate themselves to political life, which was limited in Scotland to those who possessed considerable landed wealth. They assumed Canada's political leadership almost from the start, and represented the whole spectrum of political activity, from John Strachan's conservative Family Compact to William Lyon Mackenzie's radical reformism. Scots also dominated Canada's economic affairs, particularly the fur and timber trades, banking, and railway management. In the 1880s, forty-eight percent of Canada's industrial leaders had either been born in Scotland or were the sons of Scottish immigrants. In the last three decades of the nineteenth century, the flow of Scots coming to Canada remained relatively constant: about eighty thousand emigrated during this period at an average of 2,600 annually, even though a great many more favoured destinations in the United States and Australia or New Zealand by this time. While immigrants from Southern and Eastern Europe flooded North America at the start of the twentieth century until the First World War, a quarter of a million Scots came over, too - as many as in the previous century. Another two hundred thousand emigrated during the inter-war years. A large portion of these immigrants hailed from the urban area of Glasgow, where nearly half the country's population had clustered, and chose to settle in Ontario and the western provinces rather than the Maritimes or Quebec. The Canadian federal government, eager to populate the empty prairies, stationed immigration recruitment agencies in strategic locations throughout Britain, beginning with Glasgow in 1869, Aberdeen in 1907, and Inverness in 1923. As the perils of industrialization emerged full force - such as underemployment, overcrowding, poverty, and disease - the number of charitable emigration societies also emerged during the Victorian era to assist disadvantaged women, impoverished children, and unemployed artisans. 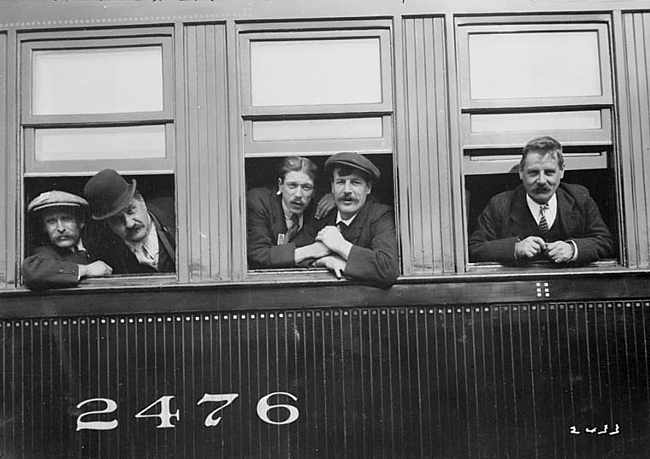 The Salvation Army, the world's largest emigration agency in the early twentieth century, was active in Scotland before and after the First World War, and viewed immigration as a critical step to relieving destitution in Britain. 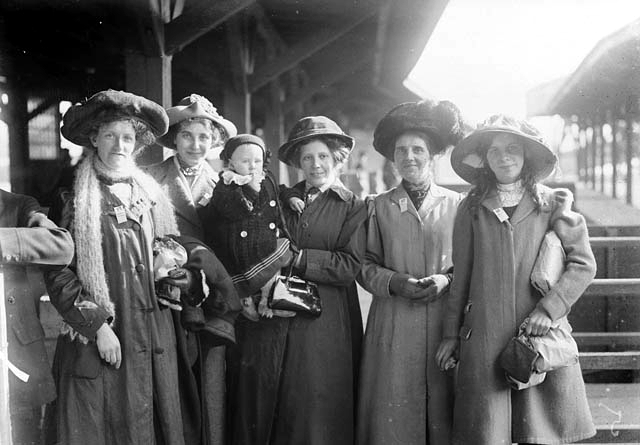 By 1930, the Salvation Army had sent two hundred thousand British immigrants to Canada, providing single women, unemployed men, and children with assisted passages overseas. Between 1872 and 1930, the Quarrier's Orphan Homes of Scotland sponsored the emigration of more than seven thousand of its wards to Ontario as part of its wider rescue and rehabilitation program. 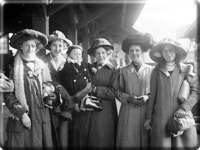 The Countess of Aberdeen also sent over three hundred young women to Canada to work as domestic servants with better prospects for secure marriages. Scottish servants were in high demand in Victorian Canada, having become known for their shrewdness, piety, and incomparable work ethic. Whereas the first influx of Scots to Canada had been predominantly composed of Highlanders, Scottish emigration patterns of the late nineteenth and early twentieth centuries were marked by Lowland populations. Until the Victorian era, Lowland Scotland had been able to absorb the bulk of its increasing population in ways that the Highlands could not, so that many of its emigrants had been motivated to leave more by the potential for prosperity rather than having been pushed out by destitution. 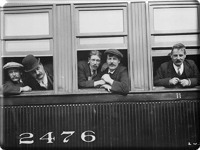 However, by the turn of the twentieth century, the Highlands had stabilized while poverty and unemployment prompted disproportionate Lowland emigration. Many of them trickled into the Canadian west at the end of the nineteenth century, having been attracted by the federal government's aggressive recruiting campaigns. By the turn of the twentieth century, the trickle had become a flood: Canadian government statistics show that, in June of 1904, 12,627 Scots had departed from Glasgow on ships bound for Canada in the previous year. Of that population, 38% of them settled in western Canada, including 445 in British Columbia, 1,005 in present-day Alberta and Saskatchewan, and 3,391 in Manitoba. Five years later, 43% of the 11,810 Scottish arrivals in Canada headed to western destinations. According to the 1911 census, approximately sixteen percent of western Canada was populated by people of Scottish ancestry. The British and Canadian governments cooperated in assisted immigration schemes during the inter-war years. 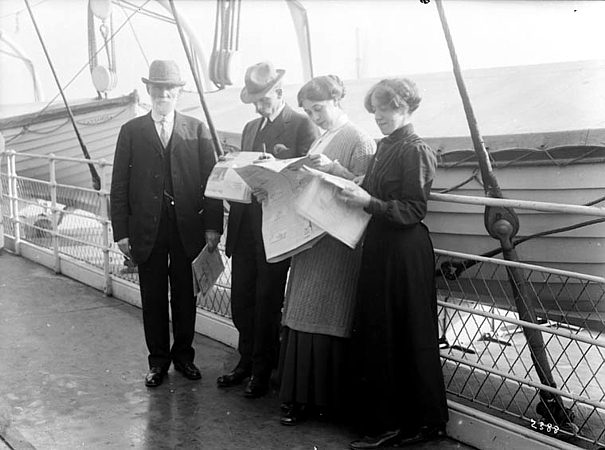 While the bulk of Britain's emigrants went to Australia between 1922 and 1935, over one hundred thousand people - experienced farmers, prospective farmers, ex-servicemen and their families, domestic servants, and more - came to Canada through assistance programs. Although there are no records that indicate how many of these immigrants hailed from Scotland, it can be estimated from the previous century's emigration patterns that Scots made up between fifteen and twenty percent of the total. Since World War II, over one quarter of a million Scots have immigrated to Canada. Unlike their predecessors, the recent immigrants have been less attracted to regions with high concentrations of Scots, such as Prince Edward Island or Nova Scotia, settling instead in the urban centres of Toronto, Calgary, and Vancouver. During the twenty years following the war, Scottish immigrants hailed largely from the middle and professional classes, attracted to high standards of living that were unattainable at home. Post-war Scotland was marked by an atmosphere of austerity, its new social gains marred by severe shortages of material and luxury goods and high levels of taxation. By the mid 1960s, the Scots were voting against the incumbent Conservative government with their feet. The new Labour government of 1964 adopted a program to stem the exodus from Scotland by improving its economic conditions. Emigration rates fell in the 1970s as the economy began to improve, sparked in no small measure by the discovery of oil in the North Sea. Scots still represented sixteen percent of total British immigration to Canada as late as 1974 (or 6,259 out of 38,456 total immigrants), but by the 1980s the rate had fallen below 1,000 per annum. The ethnic mosaic of Canadian society, coupled with its long history of Scottish influence, allowed Scottish immigrants to retain and promote their ethnicity. With a Scottish population rivaling the one in Scotland, Canada boasts the world's most pronounced legacy of Scottish migration. Scots have been shaping Canada since its establishment as a British colony, injecting every level from the grass roots to the Cabinet with characteristic sagacity, tenacity, and zeal. The story of the Scots in Canada is the story of Canada - one cannot be extricated from the other, so mutually dependent are these historic narratives. "Scotland has done more to shape Canada than any other country in the world. If anyone at home casts doubts on our ability to be a success they only have to look at Canada, one of the most successful nations in the world, to learn what Scots are capable of."